You know what isn’t cool? 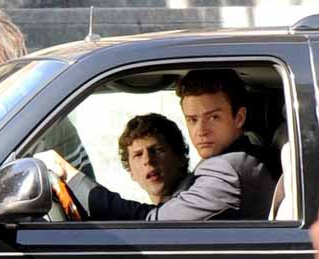 $35 million isn’t cool … So in a move that makes truth stranger than fiction, Justin Timberlake, who played Facebook president Sean Parker in a movie called The Social Network, has taken an ownership stake in a real life social network as part of News Corp.’s Myspace sale. Outgoing Myspace CEO Mike Jones just tweeted congrats to Timberlake on the deal. My verdict? This is super weird, especially considering the guy who Timberlake played in the film gave a lengthy explanation of why the social network failed, in an interview last week. According to the press release, Timberlake will play a “major role” in strategy and creative direction for the beleaguered social network. The release makes no mention of exactly how much of a stake the pop star will have. “There’s a need for a place where fans can go to interact with their favorite entertainers, listen to music, watch videos, share and discover cool stuff and just connect. Myspace has the potential to be that place,” Timberlake was quoted as saying. The new Myspace site will be unveiled at a press conference later this summer. So is this Timberlake news an attempt by Specific Media to leverage the mother of all celebrity moments in order to begin the arduous process of reinvigorating the property? Well it’s definitely provided a distraction from the tales of doom and gloom surrounding the sale and layoffs.